Größe dieser Vorschau: 437 × 599 Pixel. Weitere Auflösungen: 175 × 240 Pixel | 350 × 480 Pixel | 438 × 600 Pixel | 560 × 768 Pixel | 1.244 × 1.705 Pixel. Français : Dieu l'architecte de l'univers, frontispice d'une bible moralisée. 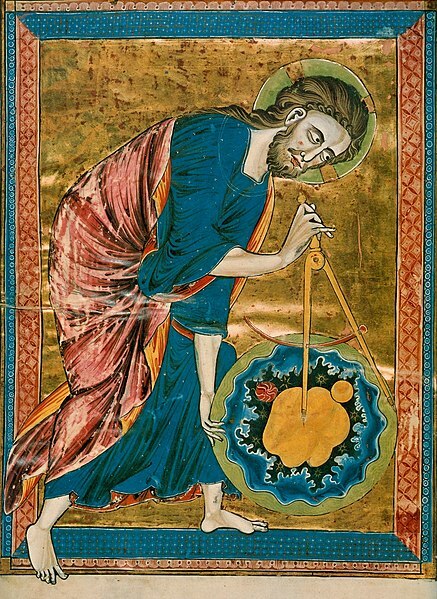 English: Science, and particularly geometry and astronomy/astrology, was linked directly to the divine for most medieval scholars. The compass in this 13th century manuscript is a symbol of God's act of Creation. God has created the universe after geometric and harmonic principles, to seek these principles was therefore to seek and worship God. English: Famously used as the first color illustration to Benoit B. Mandelbrot's The Fractal Geometry of Nature. aktuell 18:02, 19. Apr. 2014 1.244 × 1.705 (1,76 MB) Eugene a Reverted to version as of 16:31, 10 October 2011 Miniature painted on a gold background. This is the real color. 19:33, 20. Jan. 2006 366 × 500 (103 KB) Ragesoss Found on the web in August 2005, source unknown. Image is from a 13th century illuminated manuscript.